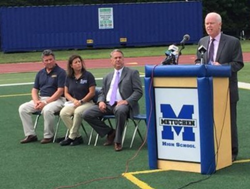 On Wednesday, August 2nd, 2017 at 10:30 in the morning, Athletic Trainers’ Society of New Jersey (ATSNJ) President, Christina Emrich MS, ATC, stood on the football field of Metuchen High School with Senator Patrick J. Diegnan, Jr., Dr. John Kripsak, D.O. who serves on the sports medicine advisory committee of the New Jersey State Interscholastic Athletic Association and Dr. Ken Herman, D.O., Chief of Emergency Services at JFK Medical Center. Together these individuals joined forces to speak on the dangers of heat related illnesses. The dog days of summer are now upon us and signal the return of high school, collegiate and professional athletes to their fall sports season. With temperatures spiking during peak athletic times, athletes become more susceptible to heat stroke and heat related illnesses. As these athletes prepare for successful campaigns on the field and in the gym, athletic trainers are standing behind them monitoring for safe participation practices. Senator Diegnan spoke about the importance of a “life-saving device” known as a Wet Bulb Globe Temperature (WBGT) monitor. The device is currently used at the professional and collegiate levels, but is not mandatory for NJSIAA member schools, which Diegnan would like to change.“We’re talking less than $200,000 for the entire state,” Diegnan said of making at least one WBGT monitor available to New Jersey’s 500 school districts. “To me, it is the definition of a no-brainer. Is it worth $200,000 to save kids’ lives? Absolutely.” Senator Diegnan said he plans to introduce legislation in the next few months that would require school districts to obtain and use WBGT monitors which will hopefully take effect next year. A WBGT monitor measures ambient temperature, relative humidity, wind, and solar radiation from the sun to determine environmental conditions during times when it is in use. The individual using the device relies on specific guidelines to determine if modifications need to be made for activity such as the removal of equipment, increased water breaks, increases in hydration intake, limiting the amount of active time as compared to inactive time and shortening the length of or possibly even canceling the event. ATSNJ, Inc. consists of licensed athletic trainers, physicians and other allied healthcare professionals whose goal is to promote quality healthcare for athletes in any setting. For more information, please visit us on the web at http://www.atsnj.org or on Facebook (ATSNJ’s New Jersey Sports Safety), Twitter (@NJSportSafety) and Instagram (atsnj).